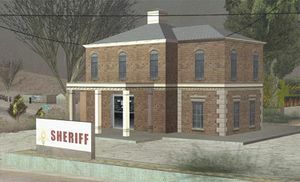 The Fort Carson sheriff's office in GTA San Andreas. The Fort Carson sheriff's office is a rural San Andreas Police Department station in Grand Theft Auto: San Andreas. Located in the town of Fort Carson in Bone County, San Andreas, it is the only police station in Bone County. Interestingly enough, if the player is arrested anywhere near Fort Carson, they are redirected to the El Quebrados sheriff department in El Quebrados, Tierra Robada instead. The building is neither accessible to the player nor has an interior. In addition, no law enforcement vehicle spawns around the building; instead, a random traffic vehicle will always appear in its parking lot. This page was last modified on 5 August 2012, at 16:47.